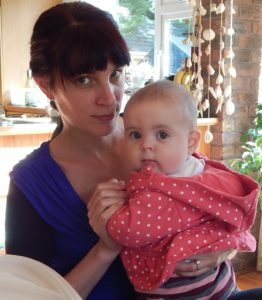 Hey there, so, this blog is about trying to be all in one for my little bundle of joy, Ruby – and how life sometimes changes our priorities. My name is Sandra, more specifically Sandra Nana Woller. No, the Nana is not a title, it is my middle name and no, my mom did not have a strange sense of humor. According to her it can be translated as Maria and came from her Nanny, who had been Czech. It was a tough one in school. By the time ‘google’ came around and I could have checked I had stopped getting upset over things like that. Mainly because when you are a German living in Ireland you get wound up a lot anyways. We are famous for having no sense of humor after all! The Irish see it as a personal mission to teach us humor and the persistence of my friends paid off, I think. By the way, we are not born without that particular trade, it just hasn’t really been nurtured a lot. studio was probably the most boring time of my life! Once graduated I decided to spice things up and change into women’s-wear. At least I’d be versatile if nothing else, right? And just to have tried everything I moved to a big international company. However, that was in production and I just could not have done the same thing for the rest of my life. So I signed up for my masters but had about 4 month to spare and that was where faith intervened. I had never lived abroad. In fact I barely did sleep-overs at friends places, but after a weeks holiday in Ireland I thought that I totally could move there for the summer! No one tells you that homesickness can actually physically hurt! Thank god it was like the flu and pretty much disappeared after the first week of working in a riding stables. I really could not tell you whether I was so exhausted every evening from the physical work or the trying to switch my brain from German to English. Dinners were normally a quick affair therefore, normally a Pizza or whatever else did not need attention. In bed I felt muscles hurt that I didn’t even know existed before! It cured the homesickness and as I got used to the work I met so many great girls that going home was a dreaded event. What can I say, there are enough stories from these four month to fill another blog about growing up, drinking too much, laughing, loving, being heart-broken and picking yourself up again that I might just consider that. But this one is meant for my new passion – being a resourceful mom to Ruby! Funny how things change when you become a parent. I suppose I never realized how many different jobs you have to cover! It unfortunately outlines how many things you don’t know! How did our parents survive without google? Or better how did we? !